The great thing about working with LONAP is that I get to meet interesting people in interesting places. Yesterday my daughter Hannah and I met with Barry O’Donovan (INEX) and Mara Novakovic (LinkedIn) for early door at Slattery’s pub in Dublin. It’s a big rugby pub that is heaving when there is a match on. 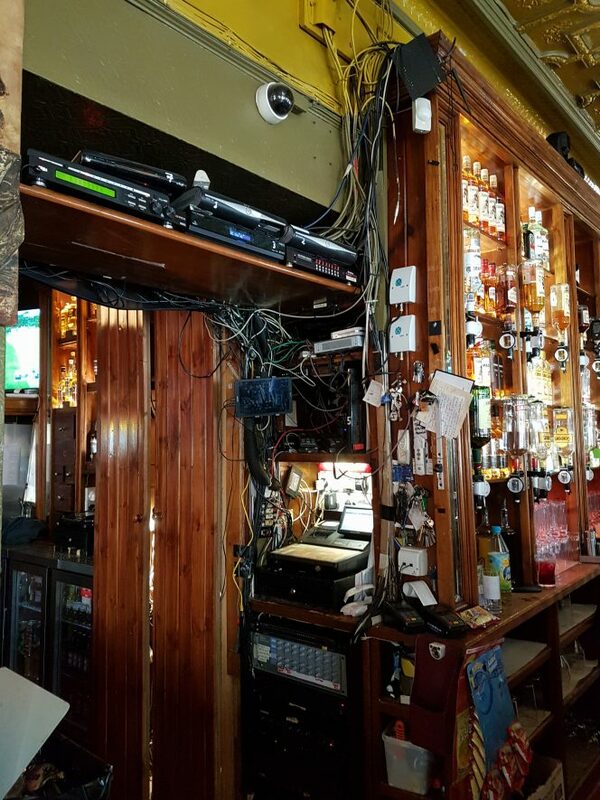 Apart from the Guinness and the considerable choice of beers the one thing that stood out about Slattery’s was the wiring. I challenge anyone to produce a picture with a worse tangle of wires that in the featured image. It’s so bad it’s a wonder anything gets fixed when it breaks – how would you find the right cable? Over in Dublin with LONAP for the UK and Ireland Peering Forum. It’s been a very good morning – a morning of talks and opportunities to chat with colleagues, members and potential members. Other peering posts on this blog. Pic courtesy of Barry using my phone.